Supernatural hitting 300 episodes is a milestone that very few hour-long dramas get to accomplish; especially series that spend so much time with two main series leads that have not departed the series. The last time Supernatural had a big anniversary it cane with a musical; this time around, things are stuck closer to home. We’re not allowed to talk about “how” or “why” it happens, but Jeffrey Dean Morgan makes his first appearance on Supernatural in over a decade as Sam and Dean’s father. With this, we get to see how the other characters react to his return, and get to have some long-earned character moments. Dean, Sam, and Mary are all affected differently by John Winchester’s return. I lost my father probably around the same age that Sam Winchester did, though I had a much better relationship with mine. Still, the notion of having him back… Jensen Ackles, Jared Padalecki, and Samantha Smith all played this so well. And Jeffrey Dean Morgan slipped back seamlessly into John. Andrew Dabb and Meredith Glynn are the credited writers on this episode but there are definitely vibes of the Eric Kripke era of the show whenever John is on screen. Some anniversary episodes bring back a lot of characters from the past; this episode doesn’t do that beyond John and Kurt Fuller’s Zachariah. Castiel (Misha Collins) is present — and there’s even a hint of what he was like when we first saw him on the series — but other current players like Alexander Calvert and Mark Pellegrino do not appear. As much as I like those actors, this is actually nice, because the spotlight is on the Winchesters and “the family business.” Who would have thought we would ever get to see John Winchester seeing the men that his boys have become, let alone hanging out in the Men of Letters bunker with the guys and Mary? Supernatural has run for 300 episodes now and if you are not an expert on the series the 300th episode was still very easy to follow. It honors and looks back at the history of the series, and if there was any prevailing response I had after watching the 300th, it was that I want to pop on Netflix or my Supernatural DVDs to revisit where it all began. I don’t think there’s a better compliment I can give it than that. Carry on, wayward sons. Looking forward to 400. 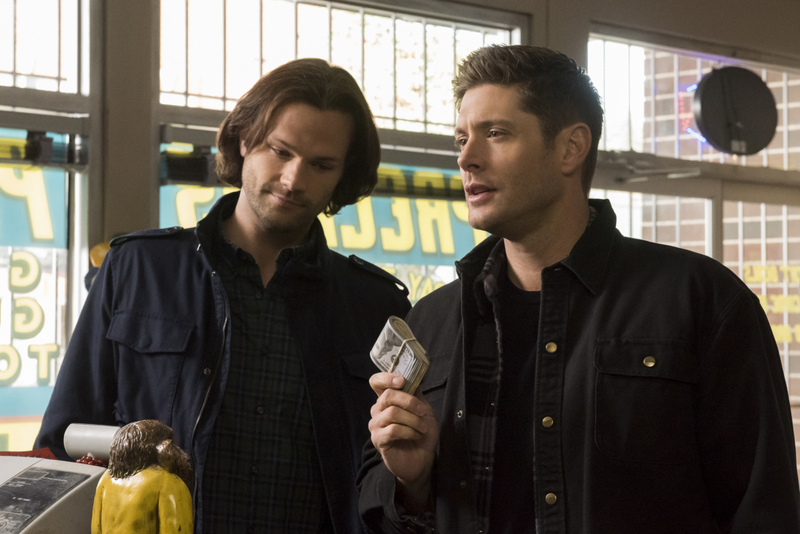 Supernatural -- "Lebanon" -- Image Number: SN1413A_0030b.jpg -- Pictured (L-R): Jared Padalecki as Sam and Jensen Ackles as Dean -- Photo: Dean Buscher/The CW -- ÃÂ© 2019 The CW Network, LLC. All Rights Reserved.